Shot of the Day – Paris (The Wall for Peace) | Aren't We All Just Tourists Here? The Wall for Peace — 54 feet long, 45 feet wide and 30 feet high — is bisected by a walkway that offers a perfect perspective that has attracted tourists since 2000, when it was built for the city’s millennium celebration. It was orginally supposed to be a 3 month installation that has been standing for almost 14 years. The word “peace” is inscribed in 32 languages and 12 alphabets on the glass and 20-foot-tall metal columns standing sentries on either side. 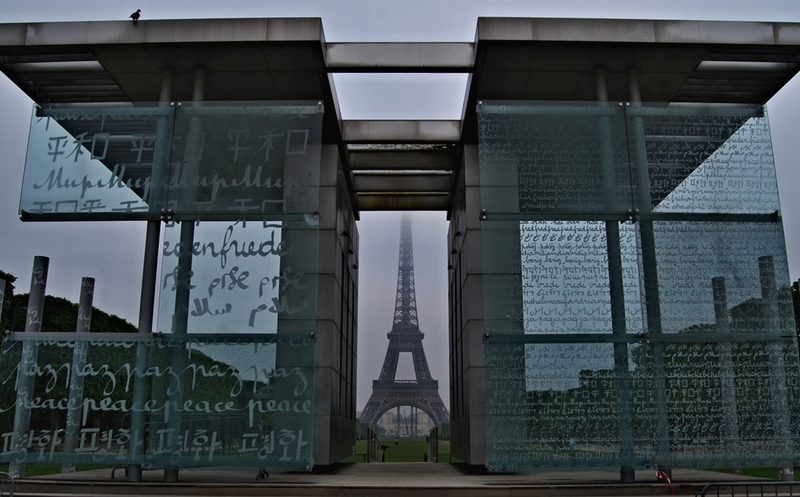 This entry was posted in Photography, Travel and tagged landmark, memorial, Paris, Photography, Wall for Peace by Steven. Bookmark the permalink.